Medulin is one of the only cities in Istria, which offer as nice Sandy beach, most of the Hotels in Medulin are situated in the surrounding area of the beach Bijeca. The hotel offer in Medulin include small family hotels, an all inclusive Hotel and a 4 star luxury Hotels, here you can search and book Hotels in Medulin Croatia. The Hotel Resort Centinera is situated by the small town Banjole, between Pula and Medulin, It stretches on ca 16 500 m2 between cape Bumbište and cape Indije down the Centinera lagoon and hundred year old pine tree forest suitable for summer and winter vacation. It consists of 3 pavilions, 105 double – bedded rooms,22 single bedded rooms, 12 family rooms, aperitif bar and summer terrace. In the Resort offer is also included vide range spectra of services of our impressive Fitness centre with possibility of usage of gym and massages. The Ai Pini Resort in Medulin offers 64 modern equipped apartments, in rows of 4 to 8 arranged in a circle with a central park. The resort is surrounded by lush vegetation, only 200 m from the sea, this resort is a true paradise for families with children who besides peace and tranquillity of a delightful holiday are looking for an intimate and carefree setting for their children. Rocky beach with an easy approach to the sea, kilometre long sandy beach Bijeca, pebbly beach, two outdoor swimming pools and indoor heated swimming pool of the Hotel Belvedere, all with seawater. Aparthotel del Mar is situated on the shore of the blue sea, in the idyllic fishing village of Banjole, is an ideal blend of a comfortable home and modern hotel service. With its 280 modern and spacious apartments, outstanding gastronomic offer and the special attention granted to each guest, it will surely become your favourite destination. The Aparthotel del Mar offers everything you need for your perfect holiday, Among the 280 fully furnished apartments, 187 of them have a view of the crystal clear sea while the rest overlook the lush greenery of Mediterranean pine trees, punctuated by the warm yellow colour of broom flowers and the seductive range of southern colours and scents. Hotel Belvedere in Medulin is with 450 rooms one of the largest hotels in the area, the hotel is situated next to the sand beach Bijeca. In addition to the lovely sandy beach Bijeca and rocky beach of the hotel, there are also two outdoor and one indoor swimming pool with seawater for hotel guests. This Medulin hotel Belvedere ranks as a sport trademark, since it is well established and distinguished in the world of sports for preparations of top athletes. This is the perfect Medulin Croatia hotel for guests who prefer an active holiday and can keep fit thanks to the wide range of sports activities. Arenaturist’s animation club for adults and children starts with its activities at 9 am and continues until after 11 pm. Hotel Medulin is a 4 star hotel situated in Medulin, the hotel is part of a holiday resort by the sand beach Bijeca, which also include Hotel Belvedere and camping Medulin, This seafront luxury hotel is especially attractive because of its distinguished style and comfort, whereas the luxuriant Mediterranean vegetation and crystal clear sea make it even more alluring. The Hotel Medulin provides high quality comfort for a relaxing 4-star holiday only 100m from the beach in the small town of Medulin, 500 meters from the centre and 10 kilometres away from the historic centre of the town of Pula. 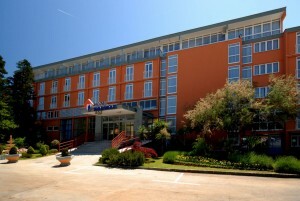 The Hotel Holiday in Medulin is one of the few Hotels in Medulin and the pula area offering all inclusive holiday. The hotel has 192 modern and comfortable equipped rooms located on four floors, all with shower bath, air condition and equipped with telephone, satellite TV, and hair dryer. Rooms with sea view have a balcony with a beautiful view of the islands and peninsulas. 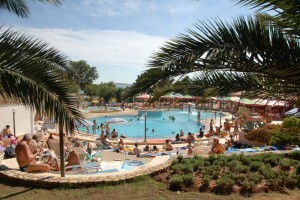 It is the ideal Medulin holiday hotel for families with small children owing to the nearby sandy beach and the unique children’s animation program Mini Club. In addition to the lovely sandy beach Bijeca and rocky beach of the hotel, there are also two outdoor swimming pools with seawater for hotel guests. Villa Velike Stine in Medulin is a small family Hotel / Apartments house situated in a central position. The outside area at Villa Stine is equipped with a beautiful, where guest can relax on the wooden Deckchairs. The Villa Stine in Medulin has been designed as a baby friendly area, which makes it an ideal place for families with smaller kids. In the evening guest can enjoy dinner in the house own restaurant with a “Hacienda” like terrace. The Arcus Residence Hotel is a comfortable, newly built hotel situated directly by the sea, opposite the fishing port and the quayside promenade. Most of the 84 rooms in the square formed Hotel have view on the Sea. All the rooms are equipped with air-conditioning system for both cooling and heating, television with satellite programmes, phone and Internet connection, safe, hairdryer and a mini bar. From the Arcus hotel there is only a 5 minute walk to the main promenade in Medulin.